When The Vibrations, a band that had made a name for itself playing at teen dances in the early 1970s, was searching for a new name a few years down the road, it only had to look to the lyrics of Easy People written by Fort Pierce singer Gary Stewart and songwriting partner Billy Eldridge. According to lead singer and bass player Felix Moss, the lines, “We’re just easy people, rednecks all the way,” really spoke to him and band members, guitarist Jimmy Smith and drummer Gary Abercrombie. So, The Vibrations became The Easy People Band. The band members, who were middle school students when they started playing together, began playing at clubs and lounges including Big Daddy’s (on South U.S. 1 near the Kmart Plaza), the Merry-Go-Round (now the U-Haul building on South U.S. 1), the Rialto Restaurant and lounge on Orange Avenue, A.J.’s in Stuart, The Lamp Post and Long Branch Saloon in Vero Beach. Too young to drive, Smith’s mother used to drive the boys around to play until they were old enough to drive themselves. “When we played at those clubs back then, we were way too young to be in those places. They used to make us sit in their offices during our breaks,” Moss said, with a laugh. As they grew in age and musical talent, Stewart would sometimes ask them to play with him when he was in town. When he was on the road, Moss would sing covers of songs the popular hometown honky-tonk hero had recorded. They still play many Stewart songs at their gigs. “You never knew what Gary would play,” quipped Tommy Schwartz, who started playing keyboards with Easy People after the departure in 1987-88 of Robert Michael Green, a DJ at country music station WFTP-AM. Schwartz, who had returned home after a stint in the Air Force in the mid-’70s and was playing music in the Palm Beaches, joined the band after a performance with some of its members. The members always had a full-time day job to pay the bills, except for Smith, Moss said, adding that the guitarist made his way playing with other bands when Easy People wasn’t booked. As they grew older, the friends got married, settled down and started families. The guys in the band are all grandfathers now. “He said he was going to play I Love You Truly,” Schwartz said, adding that the song was Stewart’s first cover, but that he must have changed his mind as he didn’t sing that song. The band, Moss said, stayed pretty much the same until Abercrombie left the group to start a citrus trucking business. Howard Folcarelli, who had been the drummer with Stewart’s first backup band, known as Train Robbery and later as Honky Tonk Liberation Army (a tribute to Patty Hearst), was the drummer for Easy People until 1994. The group had a few different drummers over the years until the members met Joe Falco, who became a permanent member in 1997. As the older guys moved on, the younger guys moved in and began playing with Stewart when he was home from the road, Texas or Nashville. They also began opening for country music stars who were playing concerts in Fort Pierce. “We opened for Lee Ann Womack, Charlie Daniels, Earl Thomas Conley, Jimmy “Crash” Craddock and Alabama,” Moss said as the names of the country acts rolled off his tongue. “We did a number of gigs with Gary over at Brighton (the Seminole Indian Reservation west of Okeechobee),” Moss said. Following Stewart’s death, the band was determined not to have his music die with him. Covering Stewart’s songs has kept a piece of him alive for his following, a large group of longtime Fort Pierce residents. The fans still get a chance to hear Stewart’s music when the Easy People are performing and, if you listen and observe, many of those in the audience know the lyrics to all of his hits. Easy People Band still plays in the area, but not as often as the members did in their youth. Their full-time day jobs have supported their families over the years, but they have kept the music alive out of sheer love for their country roots and their love for Stewart. Schwartz said, on reminiscing about their decades of work in the country music industry, “The lifetime friends I have made are what has brought me the most satisfaction from playing and being involved in the music business. I played many years in the Palm Beach area in the ’70s and early ’80s. I have many musician friends there as well as non-musician friends. The Easy People Band plays the Gary Stewart Tribute every Memorial Day Weekend. The tribute, which seems to have found a home at Little Jim Bridge Fish Camp on North Hutchinson Island, draws hundreds of fans. “Gary’s birthday was May 28,” Schwartz said. 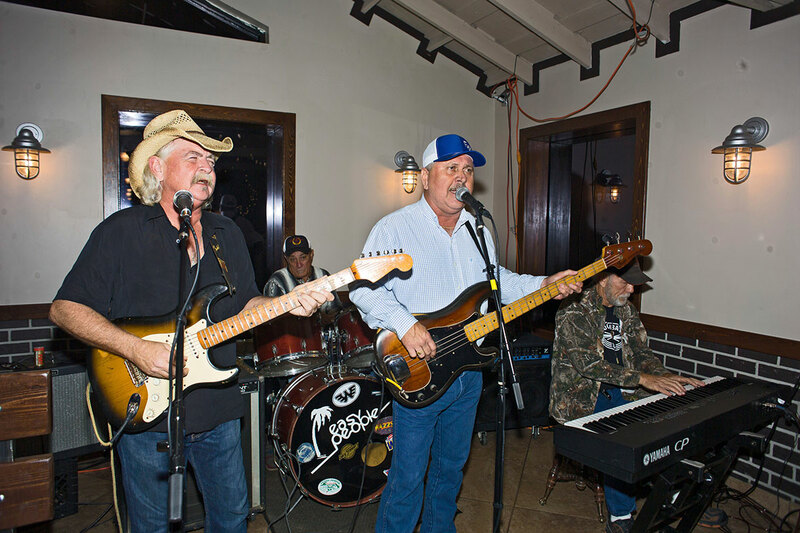 You will probably have an opportunity to see them play before the tribute, drawing a crowd at some place downtown and playing their honky-tonk tunes.